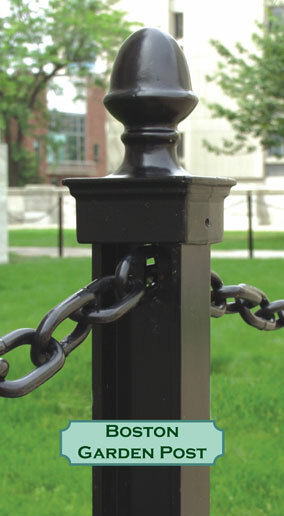 Commercial grade decorative landscape post and chain for municipal, commercial and residential outdoor installations. These high quality aluminum I-beam posts and heavy gauge steel chain create a decorative heavy duty barrier on your property. Boston Garden Post: The Boston Garden Post has an acorn style finial (post cap) that sits upon the 2.25″ x 1.75″ steel beam. 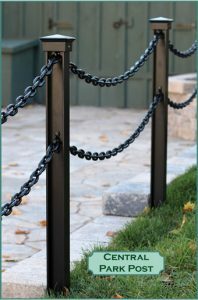 To offer superior durability and protection, the hot dipped galvanized landscape posts and chain are powder coated with a high quality rust resistant black polyester powder coating. HOW BIG ARE THE POSTS? 48″H x 2.25″W x 1.75″D: After installation, approximately 2 feet or 24″ – 26″ of post will be exposed. 72″H x 2.25″W x 1.75″D: After installation, approximately 3 to 3½ feet or 36″ – 42″ of post will be exposed. We recommend that for commercial installations the posts be no greater than 6 feet apart. Tight radius applications (curves and turns) will require the posts to be closer together. Posts should also be installed in the ground to a depth of approximately 50% of the post length and set in concrete at least 6 inches below the frost line to prevent heaving. The concrete column will vary in length depending upon the frost line (research local building codes for frost line depth). A “D” shackle (#3214) will be required for each start and stop to connect chain to post. Joining links (#3022) are required to link chain to chain. We recommend that joins be situated at a post so it is the joining link that is in the notch on the post. This hides the joined links under the post cap area. After measuring chain length you need, please add 10% more linear length to your total to allow for sag in the chain. If you are installing landscape post and chain on private property or at a residence, the choice of length is up to you but we highly recommend you don’t go more than 8′ between post. Setting each post in concrete is also optional but is highly recommended. If you want to maintain a professional appearance, you should follow the instructions for commercial installation. If found defective, powder coated posts and post caps are guaranteed against manufacturers defects for the lifetime of the products only for the original purchaser. Product must have been installed and maintained as per instructions supplied with original product. The black finish on our product is a high quality polyester powder coating. Some dulling of the finish over the years is considered normal. Where steel parts regularly strike other steel parts, the powder coat finish will chip or wear thin. This is to be expected and is not considered a defect. For warranty claims we request that we are contacted at 800.637.5427. The manufacturer will require photos be emailed to them of the defective product OR that it be returned to them in Michigan. If we deem that failure is due to a defect in the product we will replace it free of charge. Shipping charges will apply.